Don't just sew for your kids. Sew with them! Rubyellen Bratcher has invented 30 simple projects that encourage families to spend more time together through DIY activities. This mom of four learned how to sew at her local fabric shop, but soon found that her daughters were her greatest source of inspiration. Documenting her family's daily life and DIY adventures online, Rubyellen's blog, Cakies, has steadily grown into a destination for parents and crafters of all ages. 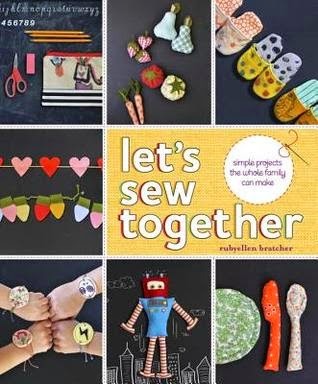 In her first book, she offers 30 projects for kids and grown-ups to make together, including a handpainted skirt, scribbled placemats, a robot friend, easy felt party garlands, overstuffed dollhouse pillows, a gorgeous world-map quilt, and much more. Each chapter also includes no-sew projects, educational activities, play ideas, and reading suggestions to encourage imagination and learning. If you like to sew and want to one day pass on the passion to your kids, this book would be the perfect place to start. The projects aren't just kid-friendly in that your kids can help make them, but the projects are ones kids will want to make. I love the idea of having kids too little to work with scissors and a sewing machine draw on the fabric, then use the fabric to make a skirt. That's a brilliant idea! This book has earned a permanent spot on my reference book shelf.